The Greens at Half Hollow is a 55+ community located in Melville, New York. Developed by the Benjamin Organization and Kabro Associates, this 1,200-home community provides residents with a wide selection of condos and attached units. A 30,000 square-foot clubhouse stands as the center for social and physical activity, where residents can work out or visit with new neighbors. Golfers who want to play a round in their own neighborhood will love that the community boasts an 18-hole, Buddy Johnson designed golf course that features a lush landscape and a challenging yet accessible style of play. 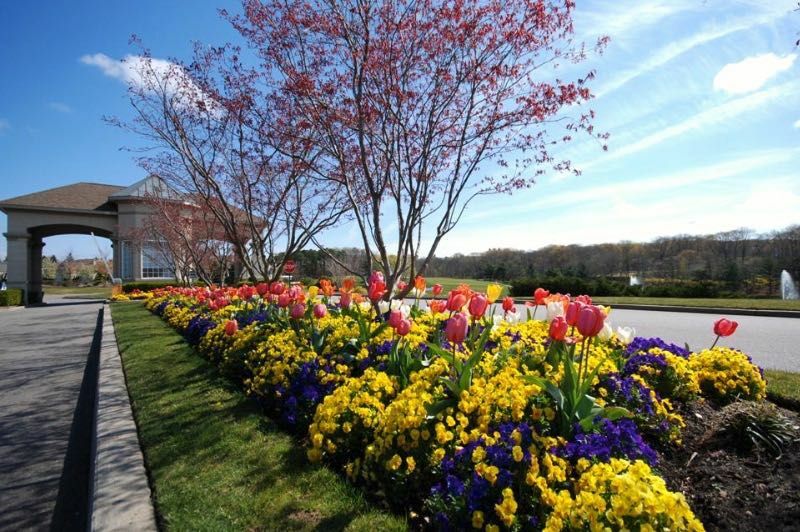 The Greens at Half Hollow has everything one would want in a retirement lifestyle on Long Island in New York. The Greens at Half Hollow has an incredible 30,000 square-foot clubhouse for homeowners to enjoy as a social space or to meet their individual fitness goals. Start your day right in the well-equipped fitness center, indoor pool, or saunas before meeting friends in the restaurant. A 6,000 square-foot multi-purpose room is for community gatherings of all sizes, while a card room is perfect for some friendly competition. Outdoors, a pool and patio helps everyone enjoy the warmer months. The Greens at Half Hollow also has four tennis courts and a walking trail for breaking a sweat. Scenic ponds are scattered throughout the community grounds, creating a picturesque backdrop to your evening walk. Golf enthusiasts will love that their next swing is outside their front door with the 18-hole Buddy Johnson designed golf course. This course, completed in 2003, takes just under four hours a round and is perfectly situated to challenge veteran players and please novices new to the game. Golfers can also restock at the pro shop or practice at the driving range before playing a round. The Greens at Half Hollow was developed by the Benjamin Organization and Kabro Associates between 1994 and 2005 and is now home to approximately 1,200 homes. The condominium units within The Greens at Half Hollow range in size from 1,040 to 1,140 square feet and offer two bedrooms and one-and-a-half or two bathrooms. These well-equipped units feature walk-in closets, private outdoor space, and open floor plans. There are several attached home options within The Greens at Half Hollow. They range in size from 1,940 to a more luxurious 3,200 square feet and offer two or three bedrooms, two or two-and-a-half bathrooms and an attached one or two-car garage. Most of these units boast Mediterranean-style courtyard entries, vaulted ceilings, and eat-in kitchens. All units have automatic sprinkler systems, while some enjoy unparalleled views of the beautiful golf course. Residents of The Greens at Half Hollow will also have more time for themselves thanks to the monthly fee that covers common area maintenance. Living in The Greens at half Hollow means enjoying a luxurious lifestyle with like-minded neighbors. Friends can gather in the clubhouse for a dinner or enjoy a quiet drink at the bar with their spouse, all without having to leave the community. The Greens at Half Hollow also holds regular events like live performances and holiday parties. Neighbors can also challenge each other over a casual game of tennis or a game of cards. The Greens at Half Hollow is located on Long Island in New York. The community is conveniently located between Interstate 495 and Northern State Parkway. A Waldbaum's grocery store is just two miles from the community and shopping along Walt Whitman Road is down the street. For traveling farther distances, MacArthur Airport is approximately 17 miles away while LaGuardia International Airport is about 30 miles away. Plainview Hospital is just over five miles away. The Greens at Half Hollow is surrounded by beautiful natural space like Half Hollow Park, Dr. Jeffrey Wenig Memorial Park, and West Hills County Park. Residents looking for additional golf courses have access to several within driving distance from the community including the Colonial Springs Golf Club and the Bethpage State Park Golf Course. History buffs will enjoy the Old Bethpage Village Restoration, a living museum that recreates Long Island life from the colonial period. Melville also hosts several restaurants, shopping areas, and museums. The Greens at Half Hollow is an unparalleled active adult community in Melville, New York.